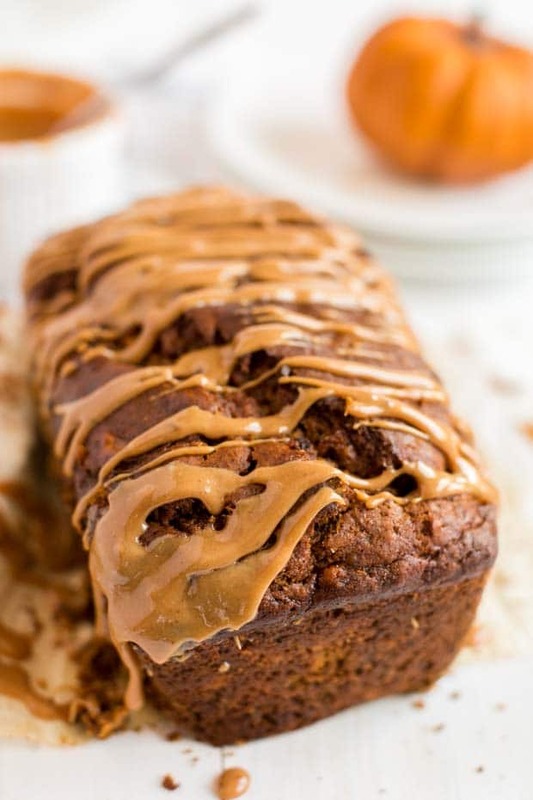 This easy Pumpkin Banana Bread is a simple recipe that produces a delicious homemade result. How about combining two fall favorite flavors into one sweet bread? 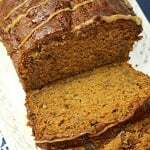 I love a good quick bread and dreams come true with this amazing, moist banana pumpkin bread. For another fantastic recipe, check out our banana pudding cake. I’ve always loved baking bread — especially with yummy mix ins to enjoy! 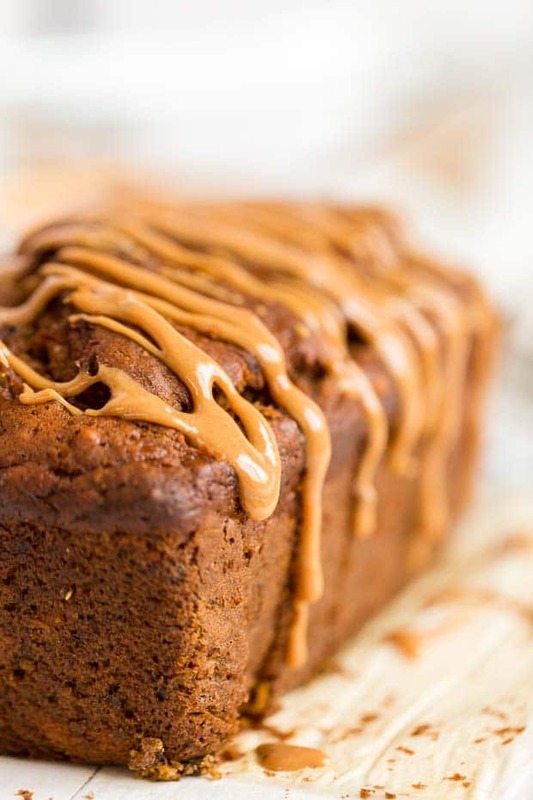 This banana pumpkin bread recipe from scratch is not only delicious, it’s versatile. You can make it with whole wheat, you could add nuts, you could make them with chocolate, with coconut oil or with applesauce. You could also easily turn this into pumpkin and banana muffins! Sometimes I make this without the glaze (I’ll share that recipe with you in a second) and we smear a slab of butter on. Either way is so delicious. 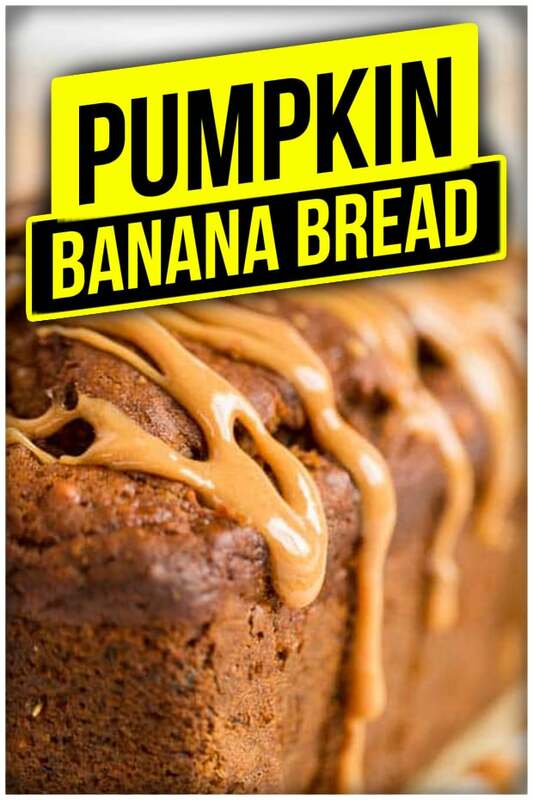 This yummy pumpkin banana bread recipe is brought to you in partnership with Mirum. Even though this is one my absolute favorite recipes to make each year, I’ve avoided it for awhile now because pumpkin can give me heartburn. It’s such a drag! 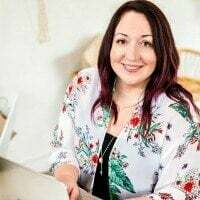 Awhile back, I realized I was skipping some of my favorite foods, even once a year treats, because I knew they would make me so uncomfortable, they just weren’t worth eating. I’ve got a solution now, though, that means I don’t need to skip my favorite foods again: Up & Up Omeprazole Orally Disintegrating Tablets. And I love that it’s an orally disintegrating tablet so I don’t have to worry about swallowing a pill. 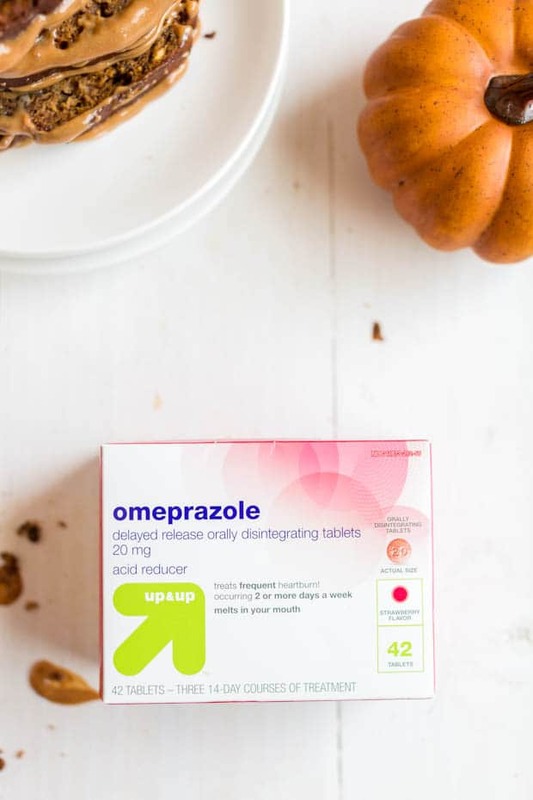 Up & Up Omeprazole ODT at Target is designed to treat symptoms of frequent heartburn. It’s an easy-to-take option which melts on your tongue; no need for water. You’ll start by preheating your oven to 350°degrees. Treat a glass bread pan with baking spray. Put the brown sugar, sugar, oil and eggs into a bowl. Stir to mix. Mix bananas, pumpkin puree and whole milk. Add to the sugar/egg mixture. Sift the flour, salt, baking soda, baking powder, cinnamon, and pumpkin pie spices together. Add pecans or walnuts. Slowly add 1/3 of the dry ingredients to the wet ingredients at a time, mix as you add. Pour into the prepared glass loaf pan. Bake at 350 degrees for 85 minutes or until a toothpick inserted in the middle comes out clean. 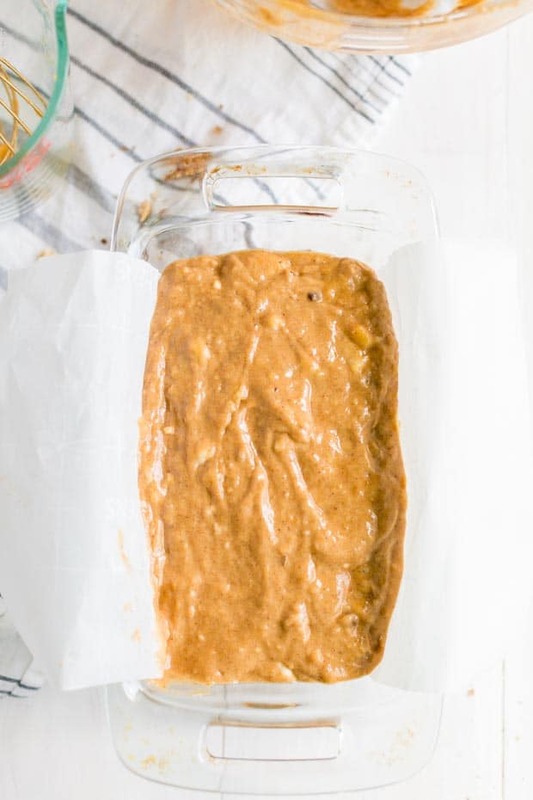 To freeze this pumpkin banana bread, just make sure to wrap it well before placing in the freezer. Our entire family gathers in the kitchen as soon as I’m ready to pull the bread from the oven. My boys always love helping to prepare it and they especially love enjoying the fruits of their labors. They’ve got glasses of milk ready to go when the bread gets on the plate. I hope you’ll enjoy this truly amazing pumpkin banana bread with your family soon. This easy, delicious, classic homemade banana bread. Try this Sour Cream Banana Bread for another great variation. This easy, delicious, moist bread recipe is so simple to make from scratch and offers fantastic flavors! 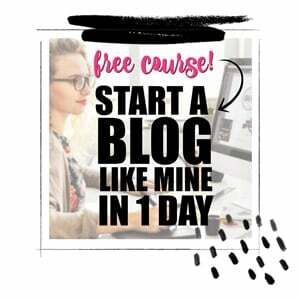 You'll start by preheating your oven to 350°degrees. Treat a glass bread pan with baking spray. Slowly add 1/3 of the dry ingredients to the wet ingredients at a time, mix as you add. Pour into the prepared glass loaf pan. Optional Homemade Caramel Drizzle INGREDIENTS 7 ounces sweetened condensed milk 1/2 C firmly packed brown sugar 1 tablespoon butter ¼ teaspoon vanilla extract INSTRUCTIONS 1. In a saucepan, combine milk and brown sugar. 2. Bring it to a boil over medium-high heat, stirring constantly. 3. Reduce heat, simmer about 8 minutes, still stirring. 4. Remove from heat, add vanilla and butter. 5. Let it cool about 5 minutes before drizzling over the pumpkin banana bread. Great Recipe! Everyone love it!! Will make again! I make this as muffins all the time for my toddler. It is one of the only ways I can get some vegetables into him and we both love them. DO YOU HAVE TO USE A GLASS BREAD PAN? No, it doesn’t have to be glass!